I recently blogged about an amazing little utility called AudioSwitcher that makes it two-clicks easy to switch your audio inputs and outputs. I need to switch audio devices a lot as I’m either watching video, doing a podcast, doing a conference call, playing a game, etc. That’s at least three different “scenarios” for my audio setup. I’ve got 5 inputs and 5 outputs and I’ve seen PC audiophiles with even more. I set up this AudioSwitcher and figured, cool, solved that silly problem. Then I got “EarTrumpet” – it’s an applet that lets you control the volume of classic and modern Windows Apps in one nice UI! Switching, volume, and more. Very “prosumer,” which is me, so I dig it. A little birdie said that I should also look closer at Windows 10 itself. What? I know this OS like the back of my hand! Nonsense! There’s a page that does double duty called App Volume and Device Preferences. See where it says “Change the device or app volume?” Ok, now DRINK THIS IN. 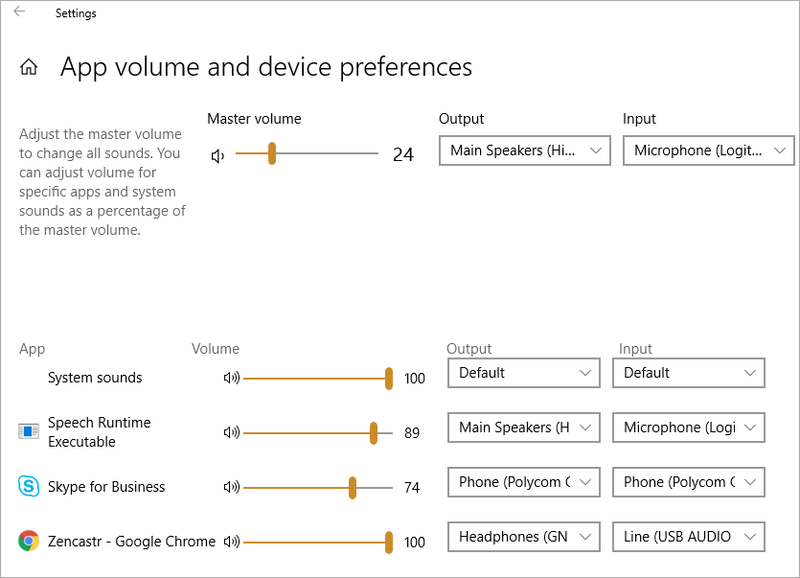 You can set the volume in active apps on an app-by-app basis. Cool. NOT IMPRESSED ARE YOU? Of course not, because while that’s a lovely feature it’s not the hidden power I’m talking about. You can set the Preferred Input and Output device on an App by App Basis. Read that again. I’ll wait. Rather than me constantly using the Audio Switcher (lovely as it is) I’ll just set my ins and outs for each app. The only catch is that this list only shows the apps that are currently using the mic/speaker, so if you want to get a nice setup, you’ll want to run apps in order to change the settings for your app. The Speech Runtime (I use WIN+H to use Windows 10 built-in Dragon-Naturally-Style-But-Not free dictation in any app) uses the Webcam mic explicitly as it has the best recognition in my experience. I record my podcast with Zencastr so I’ve setup Chrome for my preferred/optimal settings. I can still use the AudioSwitcher but now my defaults are contextual so I’m switching a LOT LESS. Be sure to pick up “EarTrumpet” for even more advanced options! What do you think? Did YOU know this existed? Sponsor: Learn how .NET in 2018 addresses the challenges developers are working on with future-focused technology. Get the new whitepaper on “The State of .NET in 2018” by the Progress Telerik team! In 2118, Will Mark Zuckerberg Be Remembered? Heard Of John Mackay? Dynamic IN Lists – Java, SQL and jOOQ.